Have some questions about RVs? Check out the recent questions submitted to LoveToKnow's resident camping expert. Have a quesiton of your own? Submit your own Ask the Camping Expert inquiry. You'll need to have a fifth wheel towing package professionally installed. 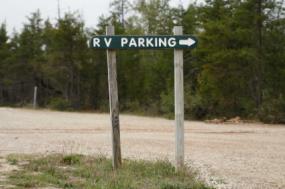 Contact a local RV service center for information about the process. The actual towing capacity you need depends on the size of camper you plan to purchase. The towing package you purchase will include information about towing capacity. You may want to look at a few RVs before purchasing your fifth wheel package, so that you have a clear idea of the size camper you'll be towing. Based on your screen name, I assume you're in Ohio. You can find information about Ohio campsites on OhioParks.net and OhioCamper.com. I'm not sure exactly where you're located, so I can't provide specific information on nearby sites. Check with the convention and visitors bureau in your area and other towns you're likely to visit to request information on campsites. Happy trails to you and your family. Enjoy your new fifth wheel camper - as soon as you find it. Dear Mary, I live in Colorado. Where is the best place to buy a used black water tank for a 1986 yellow stone trailer? It's going to be difficult to find a used black water tank for your camper anywhere. Finding one designed specifically for the year and model of camper you have is really going to be like looking for a needle in a haystack. You can order replacement black water tanks online from PPL Motorhomes (www.pplmotorhomes.com). This company specializes in consignment camper sales, so the employees are familiar with all different types of campers. The staff members at PPL might be able to direct you to a used tank. If not, they can ship a new one to you. The prices on the company's website seem quite reasonable to me. PPL is in Texas, so shipping to Colorado shouldn't be a problem. ''I have a 27 feet Maxlite RB travel trailer with a dining side slide-out. When pulled out, the slide-out leaks very badly when it rains. We can't seem to find the leak. We even covered it with a tarp. It leaked even worse. In light rain and in heavy rain. Under the carpeted dining deck also runs some wiring for the trailer. How can we stop this leaking and find the leak? It is 07 /R-vision tt27' Maxlite. How can we get the leak stopped? I can't even check for damage under the deck of the dining area. If I catch the water at one corner of the deck, it runs toward the tongue of the trailer. Finding a leak on a slide-out can be very tricky. Since your camper is very new, it's probably a good idea to contact the dealer you bought the unit from. They may have had similar inquires about this particular model, and be able to guide you where to look for the leak. If not, you may need to take it in. Additionally, you may want to verify that the camper is level. Since the water is running toward the tongue of the trailer, I wonder if it might be parked on an incline. This could result in leaking, depending on how your unit is constructed. How do I find info on an old vagabond travel trailer. the serial #255740. We greatly appreciate any information. The only way you're likely to find information about your specific travel trailer is to contact the manufacturer. They may have details on when it was built, where it was sold, etc. You might also want to check with your local license commission office to see if there's a way to locate previous owners through a title search. There are plenty of vintage camper enthusiasts. You might have good luck connecting with others who own or are interested in the type of camper you have by participating in special interest forums or chat rooms. Check out Tin Can Tourists for links to websites that cater to and attract vintage camper owners and fans. ''I am interested in purchasing a tent (pop up) trailer for my young family of 4 and 2 years old boys. There are so many makes and models out there I don't know which one to buy. Dear Quyen, Pop-up trailers are very popular choices for young families who are looking to switch from tent camping to RV camping. As I am sure you are aware, there are many different makes and models of pop-up trailers. I haven't heard bad reviews of any of the popular models, although you can generally expect that the more expensive versions have the highest quality of materials and workmanship. Personally, I'm partial to Coleman pop-ups, but that's just because I've enjoyed camping in one in the past. The most important factor to consider is how much space you'll actually need when camping with your family. Your sons may be young now, but they'll surely grow quickly. It's probably a good idea to think about what size camper will have plenty of room for your family right now, and then opt for a model that's just a little bigger. That way, you'll have room to grow and won't feel like you have to upgrade to a larger unit in just a few years. LoveToKnow Camping has conducted a good bit of research related to tent campers. A few articles that might interest you include: ATV Tent Trailers, Coleman Folding Camping Trailers, and Expandable Camping Trailers. What is the approximate selling value of a 1975 Boler camper today? Could you give me an idea?? The value of any vintage trailer varies greatly depending on the condition of the camper, how popular the style is, and how much demand there is for the particular camper among enthusiasts. I've seen Boler travel trailers listed for anywhere between $3,000 and $10,000 dollars. You might want to try visiting this Boler forum. You'll find listings for a variety of campers for sale, so you can compare their features and condition to the one you have. I've recently acquired a 19ft Yellowstone trailer from the mid 60's. It's in really great shape and I am going to start restoring it. What kind of upgrades/options would be most common/useful? It has a shower/latrine, stove, refrigerator, heater and hot water by gas and is fully wired for electric. I'm really hoping to enjoy this in the Blue Ridge Mtns here in NC. Congratulations on your decision to purchase a vintage camping trailer. You are in for a fun and exciting camping adventure. My husband and I used to own a vintage travel trailer, and you can read all about our restoration experience in Airstream Restoration. We learned very quickly that older campers that appear sound sometimes have structural issues. The first think you should do is verify that the flooring in your camper is solid and that the seams are free from leaks. If you are fortunate enough to discover that you don't have any structural problems, make sure to apply sealant to the seams to avoid leaks from developing in the future. It's also a good idea to flush the liquids from all of the systems so you can be sure that everything is fresh. You may want to have a professional verify that the electrical and gas systems are in good working order, just to avoid any potential safety hazards from older wiring or plumbing. As far as upgrades go, I say that part of the appeal of a vintage trailer is being able to enjoy using the older amenities. I suggest keeping the original stove and refrigerator, assuming they are functional and serve your purposes. Since you're planning to camp in the mountains, it's a good idea to invest in an electric braking system. Otherwise, it sounds like you are good to go! I would like to know what brand of camping trailers do NOT use wood products for the underbelly...and what brand of camping trailers have enclosed underbellies? While it seems that RV design may be headed toward minimizing the use of wood in trailer construction, there aren't many wood free options as of yet. I was able to find a folding camping trailer that uses no wood in the underbelly, or anywhere else in the camper. If this option interests you, check out the Quicksilver folding trailer by Livin' Lite. Please note that this is not an all exclusive list of camping trailers that have enclosed underbellies. The majority of the newer trailers do actually have this feature. It's also important to be aware that older models may not be built according to the same specifications as newer models, so be sure to verify with the dealer or seller whether or not the particular model that interests you actually has an enclosed underbelly. When you're choosing among the different brands, keep in mind that there are several factors to consider other than just whether or not the underbelly is enclosed. Some trailers have simple enclosures, designed to protect the bottom of the camper from damage resulting from exposure to the elements. Some trailers offer an additional layer of protection by adding insulation to the enclosed underbelly. If you live or camp in particularly cold climates, you may even want to investigate some of the higher end trailers that offer underbellies that are enclosed, insulated, and heated.